The past few months I’ve been thinking, it is just me or are the mosquitoes as bad as they seem to be? As it turns out, it is the worst mosquito season in history, or so I am told. To be outside means you have to either keep moving or don long sleeves and long pants because within less than a minute, five to six mosquitoes will be on one limb of your body. Well, ok. I can handle that. But, I want my two pups to be able to play outside without seeing them covered in mosquitoes. Solution? Bat house! Problem solved or an example of impulsivity? Maybe both. But, I’ve found there are very few moments in life that demand an immediate reaction. Mosquitoes and bat houses should not be one of them. In learning to keep impulsivity in check, did I develop a different neural pathway? I think so. Each person’s neural pathways are created over time. Our cells talk to each other. They send electrochemical messages to each other endlessly. Over time, we tend to develop well worn neural pathways. The more the same cells talk to each other, the more the others do not experience as much activity or no activity, the inactive cells essentially become useless and eventually die off. The active cells keep sending the same messages between them, traveling the same path. Ok, so we’ve developed many well worn pathways in our brain. Big deal? Maybe yes, maybe no. It is a big deal if those pathways lead us away from healthy behavior. If those pathways find us repeating behaviors that are destructive or counterproductive. It is then that someone should call a time-out on the playing field. Time-out’s are good. They can help keep things in check. If life is far off base, sure it can be tough to get things headed in the right direction. But, you’ll get there. Take the steady approach, thumb your nose at impulsivity, and while you are at it, bake a quiche. Why? Why not. For dinner, I pair it with a simple green salad and bread with olive oil. I’ve played around with a number of different types of quiches and different crusts. A quiche that I want to eat does not have a crust and relies on something other than cheese for the big flavor component. So, I stir in 2 1/2 cups of roasted vegetables. 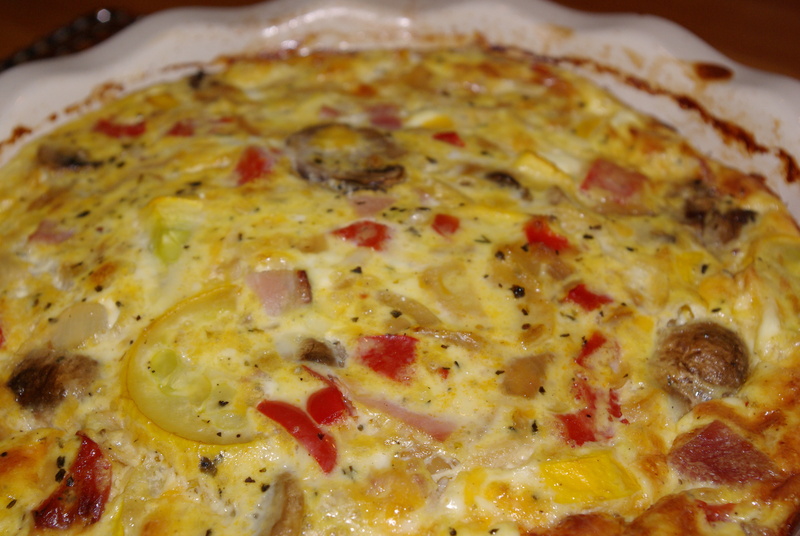 The flavor of the vegetables marries well with the eggs and cheese. If the roasted vegetables are prepared in advance, this can be a quick weeknight meal. Leftovers are good for breakfast as well, cold or hot. 1. Preheat oven to 425 degrees. Butter a deep dish 9″ pie plate. Place pie plate on a baking sheet to avoid spillage in the oven. Set aside. 2. In a medium mixing bowl whisk eggs and milk together. Whisk in cheeses, both shredded and ricotta or mascarpone. Whisk until yolks are broken and mixture is incorporated. Add salt and pepper to taste. Add oregano. Whisk to combine. 3. Fold the vegetable mixture into the cheese mixture. Stir to combine. 4. Pour the mixture into the pie plate. Bake for 30 – 40 minutes until a golden brown crust forms on the top and the middle of the quiche barely moves when jiggled a bit. Let the quiche rest for 15 minutes before serving. Serve topped with sour cream or salsa, if desired. Cooks Note: The mixture of the vegetables is up to you. Use what you have on hand. I’ve found carrots, parsnips and onions add great flavor. Add a green vegetable such as broccoli or asparagus for color and additional nutrients. Bell peppers would work well, any color. The trick is to cut the vegetables into similar sizes so they roast evenly. 2. Pile your vegetables on two large rimmed baking sheets, evenly divided. Drizzle olive oil over the top, maybe 2 – 3 T. over each pile of vegetables. Salt and pepper to taste. Using your hands, toss the vegetables to incorporate the oil, salt and pepper. 2. Spread the vegetables in a single layer on each sheet. Check for doneness after 30 minutes of baking. Roast 30 – 45 minutes until they begin to turn golden brown and are fork tender.